We created this software as a service website for a business we own. The marketing portion of the website was almost an afterthought. 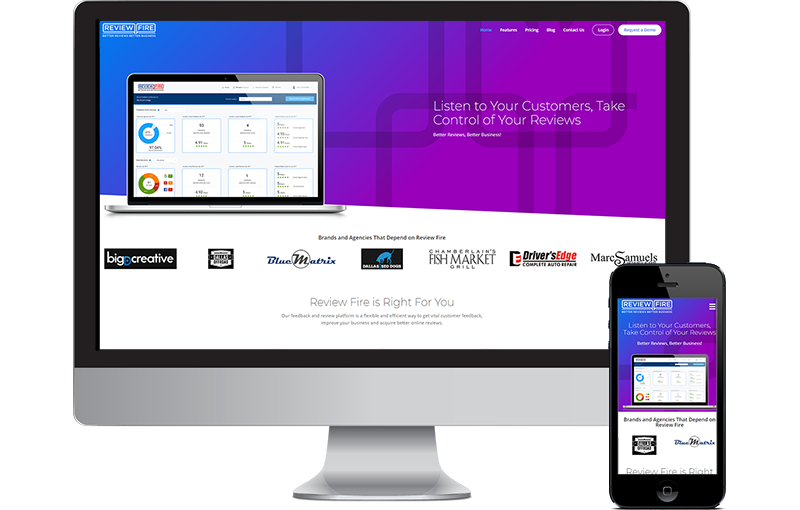 Review Fire is the reputation management software we built for our clients to get feedback from their customers as well as drive online reviews. We plan to go back and turbo charge the marketing on this project as it will be a standalone business in the near future. This website was created in PhotoShop and then cut by our CSS / XHTML experts into a custom WordPress theme. The site now integrates with multiple API, including Google GMB, ShopBoss, MailChimp, RepairShoppr, and Zenoti. We can build a custom API to your project. Mobile friendly with quick access to contact buttons on small screens. Custom built from the ground up in a hurry. Colors in he header can be managed in admin on a per page basis. We only have 22 hours into developing this website.